The Brown Jug award is the brainchild of James Reams, bluegrass musician and bandleader for 20 years, who conceived of it as a way to recognize people in the Northeast whose impact on the music deserved to be honored but who might be less likely to be recognized by national organizations since for some of them (unlike this year’s recipient), their impact was only regional in nature. The award is sponsored by The Clay Pot, a well-known Park Slope business specializing in one-of-a-kind art glass, jewelry and other gifts and collectibles. Previous recipients of the Brown Jug include such notables as the late singer-songwriter and musician John Herald, Bill Knowlton, who was named Broadcaster of the Year by the IBMA in 1997, Stephanie Ledgin, an award-winning folk and bluegrass music photo-journalist and author, the late Doug Tuchman, a bluegrass promoter who was instrumental in bringing Bill Monroe and other bluegrass music greats to play venues in the city, Peter Stampfel, previously of the Holy Modal Rounders, and in 2014 the late Bill Keith, an undisputed banjo genius. 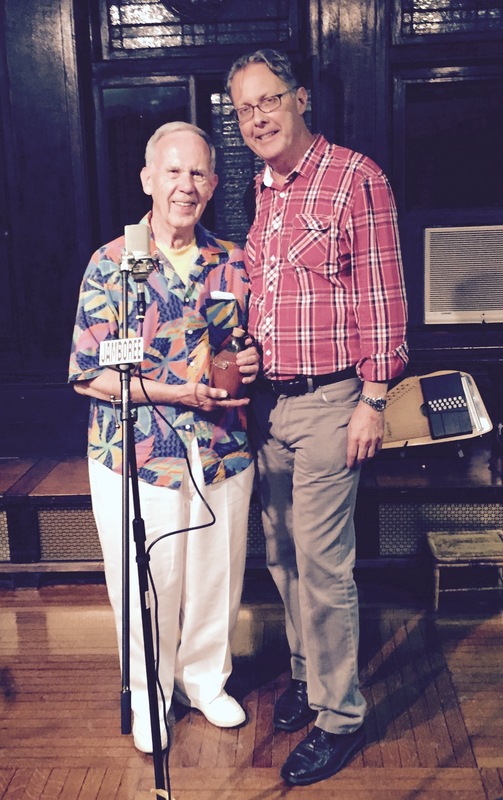 In 2015 the Jamboree was pleased to honor long-standing supporter and performer, Drew Smith, for his contributions to bluegrass with the coveted Brown Jug Award. An Autoharp Aficionado Extraordinaire, Drew Smith is probably one of the best known autoharpists in the nation as well as “across the pond”. In the 40 plus years that he has been playing the autoharp, Drew has won championship after championship across the US and was inducted into the Autoharp Hall of Fame in 2002. In 2011, he was presented with a Lifetime Achievement Award at the California Autoharp Gathering. But we’re sure that the Brown Jug Award represents the ultimate feather in his cap!